Absolutely not alone. But let’s start from some general info on the country. Colombia is a fantastic destination for a motorbike trip. Its roads are very lively and offer a variety of landscapes second to none. There are many journeys to choose from, through the Andes peaks, warm and tropical valleys, colonial villages, ancient ruins, etc. The main road network is well looked-after and the asphalt is on average in good condition. In the last few years, travelling in this country, after decades of civil war, has been quite safe as long as you avoid areas that are still considered dangerous (listed below) and finally tourism is expanding. This does not mean that we can move in full safety, especially if alone. The best thing to do, even if you enter Colombia with your own vehicle, is to rely on one of the organizations present in the country specialised in motorbike tours. In fact, you should not forget that we are talking about a country where organised crime is highly structured and microcriminality is difficult to defeat. The tourist must avoid coming into “contact” with these organizations, and it isn’t always easy. Generally the situation is gradually improving but killings and kidnappings remain constantly high, like the activity of bands of drug traffickers, especially near the borders. To travel in the country we recommend checking the road situation on the webpage of the National Institute for the road network INVIAS (www.invias.gov.co). In any case travelling during the night hours outside of the safe areas in large cities is not recommended. In the same way we do not recommend going without an organised trip to the most remote areas of Colombia and in the rural areas on the border with Ecuador (Nariño, Putumayo, Cauca, Caquetá) and with Venezuela (Arauca, Norte de Santander, Cesar). In all main cities (Bogotá, Medellin, Cali, Barranquilla, Bucaramanga and Cùcuta), there are areas where you must be very careful and talking of the tourist resorts on the Caribbean coast, even if the safety indexes are increasing, we recommend being extremely careful when off the beaten track. In the Amazon region of Leticia relevant crime incidents have not been registered for some time. People who intend to travel by bike, alone, especially in the areas most at risk, should contact their Embassy in Bogotà before leaving. In case of problems with the local Police authorities (detention or arrest) we recommend not resisting or arguing with the agents, but to immediately ask to call your closest Embassy or Consulate for appropriate assistance. Change currency only at banks and authorized agencies and use cash withdrawal services only in protected areas (within bank agencies and shopping centres); carry with you a photocopy of your identity documents, leaving passport and travel tickets in a safe place. Avoid using smartphones on the street, especially in the evening and at night, to avoid being mugged. 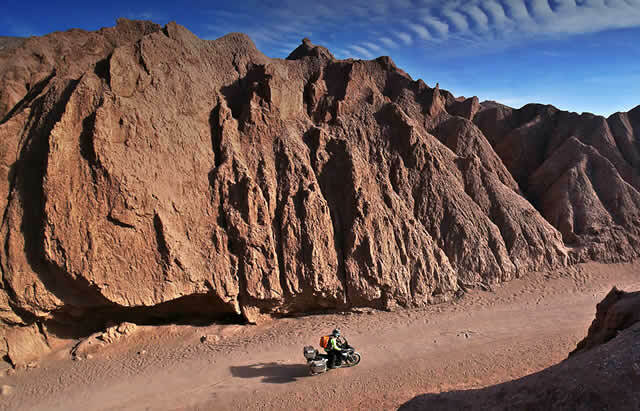 Motorbike journeys in Colombia can take place entirely on asphalt or can be paired with dirt tracks or more challenging off-road itineraries. In all cases, side bags and a capacious tank bag (where you can put documents, money, and all the essentials to never, we repeat never, leave on your bike while parked). A large motorbike bag must be part of your personal luggage, along with helmets and technical jacket, even if leaving for an organised tour with a locally hired bike. If the motorbike is yours, extra water or fuel tanks, along with all the technical accessories to protect the engine from rocks and blows, such as engine guards and carter protectors, could be really useful. Also a windshield becomes very useful in Colombia due to the low average temperatures encountered in the areas of the Andes. In case you are not followed by an organization or a local guide, always add to your equipment: a first aid kit, a tyre-repair kit, smart accessories such as sat-nav holder, wiring to recharge electronic devices. To enter Colombia you need a valid passport. The passport’s expiry date must not be less than three months from the entry date. The tourist visa is issued at arrival and is valid for up to 60 days. Once the visa has expired it is possible to renew it for a maximum of 180 days. The document is renewed at the Migración Colombia (address: Calle 100 No. 11 B -27, Bogotá). Currency formalities and taxes: upon arrival in the country it is mandatory to declare only sums exceeding the value of $10,000, by filling in a form issued by the DIAN customs authorities (Direcciòn de Impuestos y Aduanas Nacionales). Leaving the country all tourists must pay an “Impuesta de salida” (Exit tax) between 28 and 44 dollars (or the equivalent in local currency) depending on the length of your stay; tax fees are subject to frequent fluctuations, following the exchange rate Dollar/Euro-Colombian Peso. If you are leaving by plane we recommend gretting to the airport well in advance of the departure time (at least 3 hours early) due to the meticulous customs and security checks. To drive in Colombia you need an International Driving license. (1949 Geneva Convention Model ) and liability insurance is mandatory. A comprehensive insurance is highly recommended. For the temporary import of vehicles the ATA “Carnet for Temporary Admission of Goods” (CPD) is required . For italian users more information on www.aci.it. How and where to enter the country. The main points of arrival are the Airport El Dorado of Bogota and that of Medellin. The Colombian national airline is Avianca. From Italy, after the suspension of direct flights, the country can be reached using Avianca (via Madrid), Air France (via Paris), Lufthansa (via Frankfurt), and some US carriers with stopovers in the USA via Miami, New York and Atlanta. If you want to reach Colombia overland, remember that it is connected only with Venezuela an Ecuador. The most popular and safe border crossing is between San Antonio del Tachira (Venezuela) and Cúcuta (Colombia), along the main route Caracas-Bogotá. It is possible to enter the country also by sea through the ports on the shores of the Pacific Ocean and the Caribbean Sea. Maritime traffic is more intense on the Caribbean side, since there are frequent links with the United States, Mexico, Central America, Venezuela and the Caribbean islands. If you want to visit Colombia with your own bike the cheapest transportation is by sea. The state of secondary roads is on average precarious. So travel times cannot be calculated simply considering the distance, but you must take into account the actual state of the roads. 100 kilometres may take up to 3 hours. We recommend you check the situation of the national road network published daily on the webpage of the National Institute for the road network INVIAS (www.invias.gov.co) before moving overland. Drive slowly and with great care especially in urban centres, where accidents are more frequent. Pay attention also to the frequent conmen, dressed up as police officers, who force unsuspecting tourists to give them foreign currency for fake checks on their authenticity. After giving you the necessary recommendations, we can now move onto the great sensations that Colombian roads have to offer. The central part of the country is occupied by the majestic Andes, divided into 3 mountain ranges on the Ecuador/Colombia border to visit along incredible winding roads. Mountain routes, colonial villages, Caribbean beaches, big modern cities rich in history: the adventure is guaranteed! Private health care facilities are, generally, of a good level, and a lot more equipped than public facilities, but they cost a lot. It is not difficult to find medicines, but due to the risk of counterfeit medicines, we recommend going only to qualified pharmacies, avoiding non-specialised shops. Illnesses present: The health situation in the Amazon areas is particularly difficult, as in the regions east of the Andes (Llanos), the Pacific coast and the Magdalena Medio region, due to the presence of malaria, yellow fever and “dengue fever”. Numerous cases of dengue continue to be registered in the departments of Huila,Meta, Valle, Caquetá, Tolima, Norte de Santander, Antioquia, Casanare, Cordoba and Cundinamarca. For these reasons we strongly recommend the use of repellents against mosquitoes, carriers of the disease, especially in the lower swampy regions. Since December 2014 80,000 cases of people infected with the “Chickungunya” virus have been recorded in all Colombian states, particularly in the coastal and Caribbean areas. This virus is transmitted through mosquito bites, like dengue or yellow fever. The most affected cities are, Cartagena, but also Cùcuta, Medellin, Sincelejo and Santa Marta. The virus, if not properly treated, could lead to serious complications. It causes high fever and muscle pains in the joints and the head that can persist for many weeks. The only way to prevent infection, as there are no specific vaccinations, is to avoid areas with stagnant water, wear clothes that cover the whole body, use insecticides and repellents, and analgesic paracetamol and vitamin B1 (or thiamin), which you can find there. In the country there have also been cases of Zika “virus”, viral illness transmitted by the “Aedes aegypti” mosquito, also responsible for the “dengue fever” and “Chikunguya”. Warnings: In Bogota and in the main cities drinking water is disinfected using chlorine. In some districts, however, cases of intestinal infection due to tap water continue to be registered. We recommend drinking mineral water and sealed soft drinks, without adding ice, and boiling water, especially away from big cities; eat food (meat, fish, vegetables) only if well cooked and only eat fruit wthout skin. There are no compulsory vaccinations, still we recommended those who wish to visit the areas we mentioned before, after having asked for a medical opinion, undergoing the preventive treatment for malaria and taking the yellow fever vaccine. TIME ZONE: – 6 hours compared to Italy, -7 hours when in Italy Daylight Saving Time is in use. CURRENCY: Colombian Peso (COP): 1 euro = about 3,4 cop . The most widely used foreign currenies are the US dollar and the Euro. TELEPHONE: prefix from abroad: 0057 Three mobile phone operators: Movistar, Claro and Tigo. All provide international roaming service following agreements with the companies of other countries. The local technology works with dual-tri-quadri band mobile phones. MEASURING UNITS: In Colombia there is the metric system. Distances are in kms, weights in kgs, temperatures in C°, volumes in litres. Inches, feet, yards, pounds, ounces, miles, and Fahrenheit degrees are rarely used. ELECTRIC NETWORK: The domestic network works at 110 volts AC at 60 Hz. The industrial one is 220 volts. The sockets used have two or three (when grounded) pins per slot. CREDIT CARDS: Visa and Master Card are accepted by most of the hotels, restaurants and shopping malls. USEFUL APPS: Think about downloading the APP “COLOMBIA.travel” from the Apple Store. EMERGENCY NUMBERS: for the police and the ambulance it is always 123. 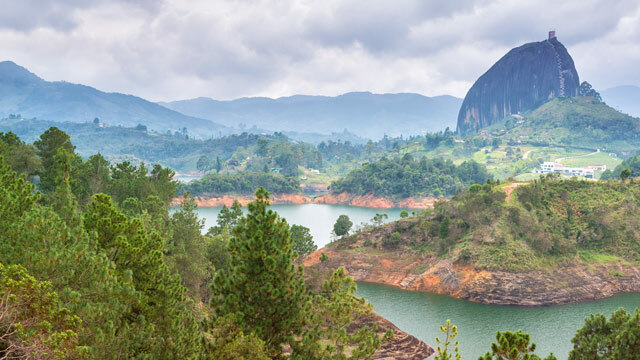 Colombia has a tropical climate, with dry periods from December to February and variable in the other periods, with torrential and continuous rain, depending also on the altitude. For example, the average temperature of Bogota, which is at 2,600 mt is 14 degrees while at sea level like in Cartagena, Barranquilla, etc. it is 30 degrees. Warm, with altitude under 1,000 m. Practically in approximately 80% of the country we have temperatures above 24°C. Temperate, between 1,000 and 2,000 m, area covering about 10% of the territory, with temperatures ranging between 17°C and 24°C. Cool with altitude between 2,000 and 3,000 m, representing the remainder of the national territory, with temperatures between 12 and 17°C.Desert, the top of the highest mountains, where the temperature drops further. The rainiest periods are indicated between May/June and October/November. A couple of proposals, chosen from the web. Danish/Colombian family company . Their headquarters is in Cali. They call themselves Motorcycle Tours and multi-brand Motorcycle Rentals since 2008. They are reliable, expert, and good at scouting. The bikes used for tours and rentals (about thirty) are recent and always ready. You can hire an average hp enduro and road maxi enduros with between 90 and 175 US dollars per day for rental + security deposit. The options offered are many. It is possible to see two oceans – the Pacific and Caribbean, historical sites, cities, the Andes range,coffee and sugar cane plantations, touch volvanoes, beaches, lakes, ancient ruins… The organisation offers turnkey tours, personalised according to the available time and riding abilities. You can choose between light and agile Kawasaki KLR650s or maxi tourers like the Aprilia ETV1000. Their support vehicle can carry luggage and any passengers who are not motorcyclists.